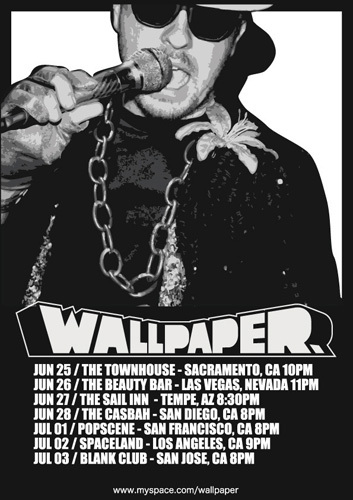 Wallpaper’s West Coast Tour | Chickens Don't Clap! It’s that time again. 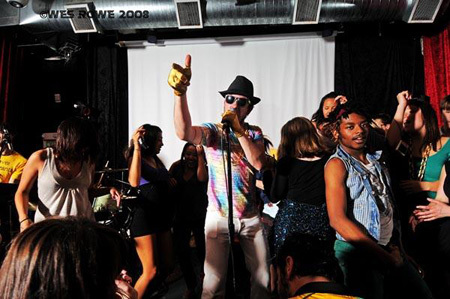 Time to get drip like a fish and straight-up lose your mind on the dance floor wit ya boys Ricky Reed and Arjun Singh, aka Wallpaper, Oaktown’s #1 in auto-tune electro-funk goodness. YOU. ARE. NOT. READY. F’real. These guys simply do not disappoint. And there should be some new jams in the mix for this tour, which starts tomorrow night (June 25th) in Sacramento, so get excited. Here in San Diego, our resident master of funked-out, talk box pop-genius Rafter is opening, which means I expect you locals to get extra excited. Hit me up if you wanna pre-party! Flyer and tour dates available after the jump. Buy: Never a bad time to pick up Wallpaper’s debut full-length Doo Doo Face on CD or LP. This entry was posted in Road Trips in the Stair-Car (Tours and Shows), Young People's Music (mp3s and streams) by Derek. Bookmark the permalink.